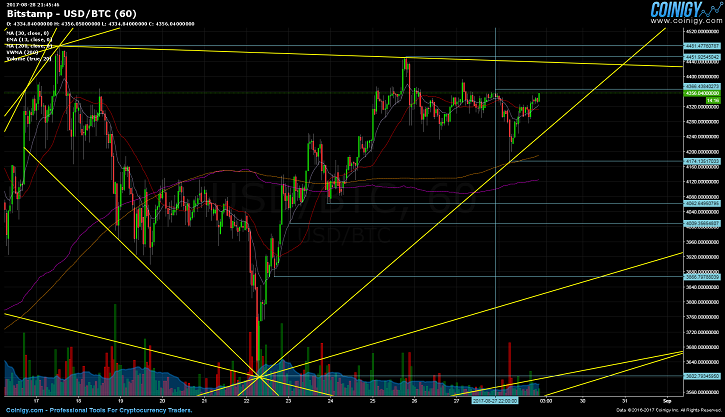 Bitcoin has kept to a stable range in the past few days. Ever since the $3,600 weekly high, the price has been on an upward trajectory. Notwithstanding, the $4,480 all-time was not broken, even though a new $4,449.98 monthly high was reached. Congestion on the whole network has lessened, unconfirmed transactions have plummeted to a relatively manageable 23,000. The median confirmation time is averaging downwards too, with the mempool size rising once again, in defiance of the seesawing hashrate. The total crypto currency market cap has ballooned to a $160 billion; with bitcoin retaining $71.8 billion, while the remainder of the $87.8 billion is exclusively dedicated to altcoins. A further breakdown of this figure, has bitcoin cash at $9.861 billion, ripple at $8.882 billion, litecoin at $3.345 billion, and dash at $2.661 billion. All other competing crypto currencies, are presently below $2.5 billion market caps. Ledger and Trezor have also integrated SegWit into their hardware framework protocols. But… I have to sent my btc to the new Segwit address. Litecoin, a crypto currency that implemented SegWit almost two months ago, has seen a rather strong rise in price in the past few days. As to whether this is the top of the run-up or not, remains to be seen. Despite the successful activation, bitcoin fees are still high for smaller transactions. A website providing detailed information and supplementary data, is accessible here. Additonaly, transaction fees are discussed even further in this Mashable article. Bitcoin mining has seen exponential growth, which is to be expected considering the overwhelming price action we keep witnessing day-to-day. It appears to be a primary income for people trying to get by in Venezuela, at least according to CNBC. On a similar note, Russian power plants have begun selling excess power directly to local miners. Regardless, no direct civilian contracts have been confirmed, as of yet. It is rather telling as to how much the whole industry has grown; even mainstream media such as CNBC, has begun to acknowledge this obvious fact, with articles comparing the bitcoin marketcap to Netflix. Bitcoin began trading today at $4,366.43 (GMT 00:01), which has so far sustained as the daily high. This was the start of a minor correction, that ended with a daily low at $4,174.13 (GMT 06:00), after which the price slowly recovered to the current $4,334.84 price level.